Banish math anxiety and give students of all ages a clear roadmap to success Mathematical Mindsets provides practical strategies and activities to help teachers and parents show all children, even those who are convinced that they are bad at math, that they can enjoy and succeed in math. Jo... read more Boaler-Stanford researcher, professor of math education, and expert on math learning-has studied why students don't like math and often fail in math classes. She's followed thousands of students through middle and high schools to study how they learn and to find the most effective ways to unleash the math potential in all students. There is a clear gap between what research has shown to work in teaching math and what happens in schools and at home. This book bridges that gap by turning research findings into practical activities and advice. Boaler translates Carol Dweck's concept of 'mindset' into math teaching and parenting strategies, showing how students can go from self-doubt to strong self-confidence, which is so important to math learning. Boaler reveals the steps that must be taken by schools and parents to improve math education for all. Mathematical Mindsets: Explains how the brain processes mathematics learningReveals how to turn mistakes and struggles into valuable learning experiencesProvides examples of rich mathematical activities to replace rote learningExplains ways to give students a positive math mindsetGives examples of how assessment and grading policies need to change to support real understanding Scores of students hate and fear math, so they end up leaving school without an understanding of basic mathematical concepts. Their evasion and departure hinders math-related pathways and STEM career opportunities. Research has shown very clear methods to change this phenomena, but the information has been confined to research journals-until now. 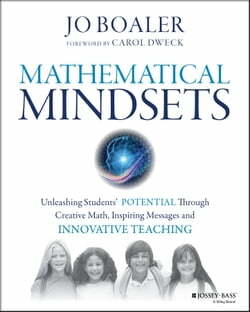 Mathematical Mindsets provides a proven, practical roadmap to mathematics success for any student at any age.